This is the play farmstand . Kids were pretending to sell fruits and ice cream. I love ice cream. We are at Retreat Farm in the playroom. Some people got to play in this little car. Our class went to a farm.It is in Brattleboro. The farm is called Retreat Farm. They had giant blue blocks in the playroom for us to build with! My friends are building a house out of the big blue blocks in the Retreat Farm playroom. 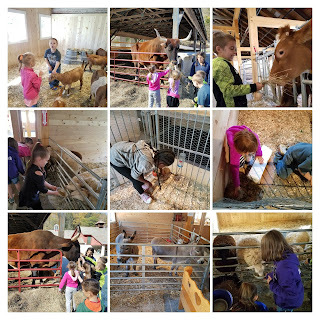 One of our favorite parts of the visit to Retreat Farm in Brattleboro On October 20, 2017 was feeding and petting the animals. They were sweet and gentle...and hungry! I am feeding a cow at the farm. It is hay. This cow is big and hungry! Our class and the other class are at the Retreat farm in Brattleboro. I am petting a chicken. This is a chicken and Megan is telling us about the rooster’s wattle. We are feeding and petting a steer at the Retreat farm.His name is Carlos. At the Retreat Farm in Brattleboro, both classes got to meet Carlos the Brahman Bull. He weighs 2,000 pounds! We are on a field trip. Me and my class are petting a bull named Carlos. He is very very soft. He weighs one ton! He is BIG. We went to the farm. We are feeling the Angora bunny fur. The fur was so soft. with them. We all loved holding the baby chicks! In this picture Mrs.V`s class is looking at and learning about seeds with the teacher,Lu. It was really windy and lots of seeds were dispersing!